If you have always wanted to explore the Rhine Valley, we are giving you the perfect opportunity to do just that. We currently have a 4-night escorted rail tour available which includes a river cruise through the Rhine Gorge, 4 nights’ accommodation and breakfast and dinner on each day. Using the charming German town of Remagen as your base, you will visit Konigswinter, Boppard and the Ahr Valley, as you take in the stunning scenery, taste the region’s world-renowned wines, admire the alluring Lorelei Rock and ride Germany’s oldest cog railway. This trip is perfect for those who prefer to avoid the often stressful process of travelling through an airport. You will meet with your tour leader and the rest of the group at London St Pancras, before taking the opportunity to get to know your new companions during your journey on the Eurostar. After changing in Brussels, you will arrive under the breathtaking spires of Europe’s most intricate cathedral, in Cologne, and then transfer to Remagen via a regional rail service. The Hotel Pinger will be your home for the following four nights, offering a comfortable place to rest your head and an excellent location from which to explore the surrounding area. This family-run hotel is just minutes from both the train station and the town centre, offers free Wi-Fi to all guests and features modern and welcoming rooms. 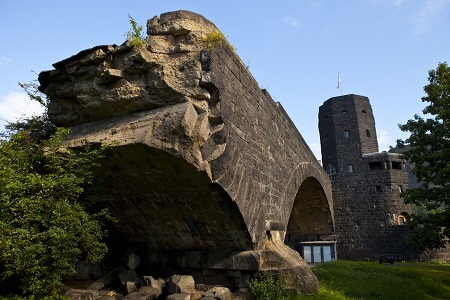 Remagen itself is famous for being home to the Ludendorff Bridge, which played an important role in WWII, inspiring a book and subsequent Hollywood film called ‘The Bridge at Remagen’. With the inclusion of a day at your leisure, where you are free to discover the joys of the Rhine Valley, this tour is great for single travellers or those in small groups. The rail aspect makes it a very peaceful and pleasant trip and the fact that you will be escorted by a UK Tour Manager will mean you can relax in the knowledge that everything has been planned out perfectly. If you like the idea of visiting this part of Germany, the escorted rail tour departs on the 15th of October, 2016. Prices are currently £445pp when sharing a twin room and £520 for those looking for single-person accommodation. Plus, if you book before Friday 6th May 2016, you will receive £50pp off the advertised price. To book, or for more information, drop in at your nearest Fred. Olsen travel shop or call us today. Alternatively, you can speak to Ray Moye, from our travel agents in Westbourne, by calling 01202 023931. Ray will also be escorting the trip and will be able to answer any questions you might have.